The heart of your café is the food you serve and your drinks. Serving food and drinks is how you make your coins in the game. You can use these coins to buy more expensive items to prepare at your stations. On your stove you can select a dish to prepare and wait a specified time before it is ready to serve. Once it is ready to serve you’ll need to click the dish a few times until the extra ingredients are added to the dish. Once this is done your avatar will move the dish over onto the serving countertop and it will be served to your guests. You must serve your dishes in a timely manner or they will spoil and you’ll lose your coins. After serving clean the stove or coffee machine and it’s ready to go for the next serving. As a new player you’ll be eager to make some dishes and get money. There’s a few dishes you can make in the early stages of your game that won’t take a whole lot of time to prepare and you’ll get coins right away. If you plan on playing for longer periods you can purchase dishes and coffee items that take longer to prepare. Be sure you don’t leave dishes for extended periods because they will spoil. 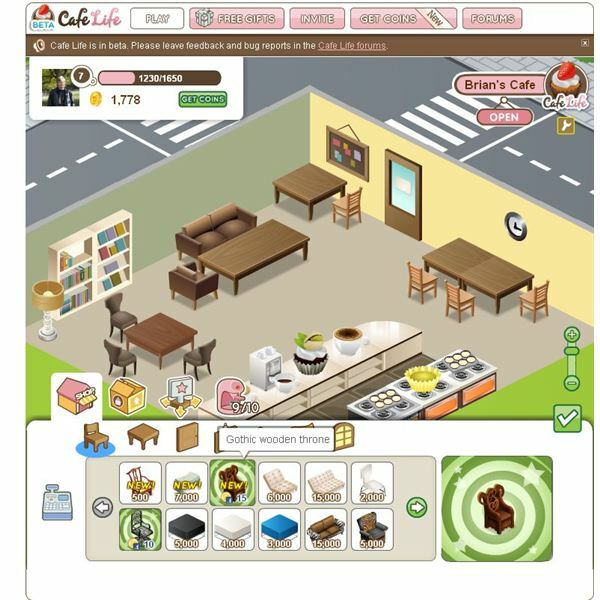 You can use the above dishes to quickly generate your café some cash without having to worry about spoilage and losing your early income which can set you back. As you level up you’ll be able to add more counters and stoves for increased production. Your guests will need seating to stay in your café. Be sure to buy inexpensive seating to begin with since you won’t have much income to work with. Don’t buy a couch just because it looks nice get something that will save you coins you can use to make more dishes. Once you have enough income then you can make your café look nice. Basic chairs and tables will cost you under 100 coins. Use the cash register and sell items from your inventory when you need extra cash or want to buy something new. Go for basic wall, floor, and other decorations to start to safe money. It can be a good idea to forget about extra decorations at least in the start when your cash is low. 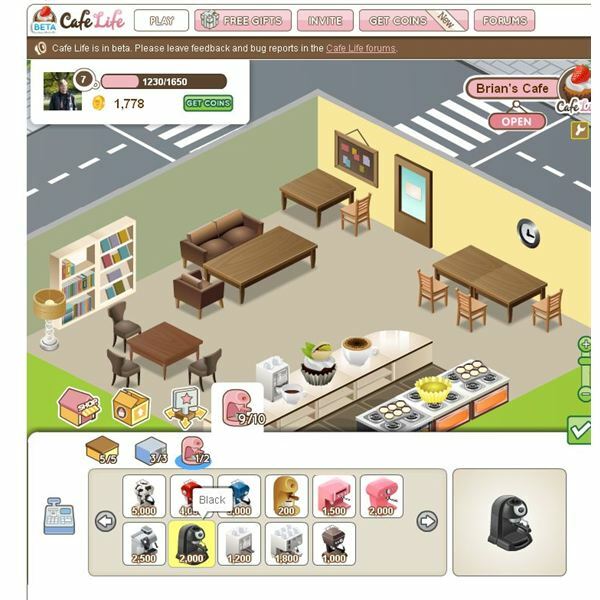 The Café Life interface is quite easy to understand. A the top left you’ll find your current level, amount till next level, and coin level. At the far right you can change your café name ad set options such as turning off the sound if you want. A the bottom and to the left you’ll find the icons for accessing your game below they are explained for you. Employee– Hire a Facebook friend to work in your store. More become available as you level. Decoration – Add items to your store like tables and chairs. Avatar – Customize your avatar the way you want and add different outfits. Functional Items – Buy more counters stoves and drink machines. Get more as you level. Menu – View all the current coffee drinks and desserts you can serve. Take Photo– Take a snapshot of your café. Gifts – Send and receive gifts from friends. 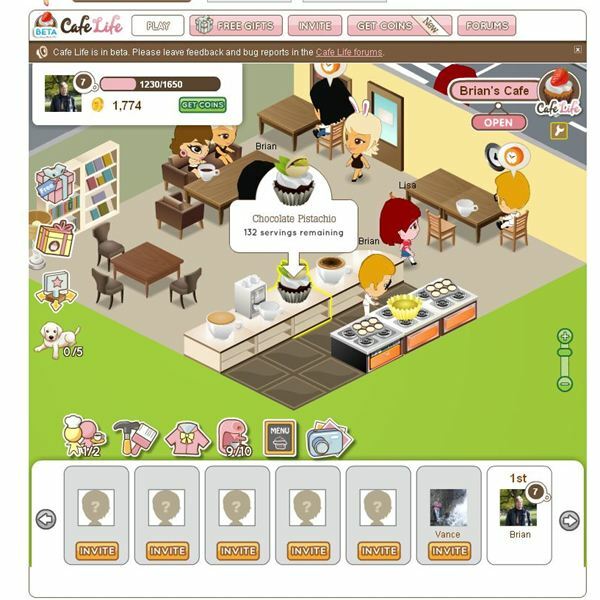 Expansion -Use Facebook friends or credits to expand your café. Adopt a Pet – Have five Facebook friends approve you and get a puppy which costs 10 Facebook credits. Be sure to only purchase items that will save you money in the beginning such as inexpensive tables and chairs. Dishes can spoil so buy ones that won’t spoil as you’re playing the game. You’ll get access to more stoves, coffee machines and countertops as you level up. You can change the look of your avatar at any time through the avatar icon. Five friends and 10 Facebook credits are required to own a puppy in the game. Use the menu icon to decide what to serve next, even if something is baking. Use the wrench icon to turn off sound or improve graphics. 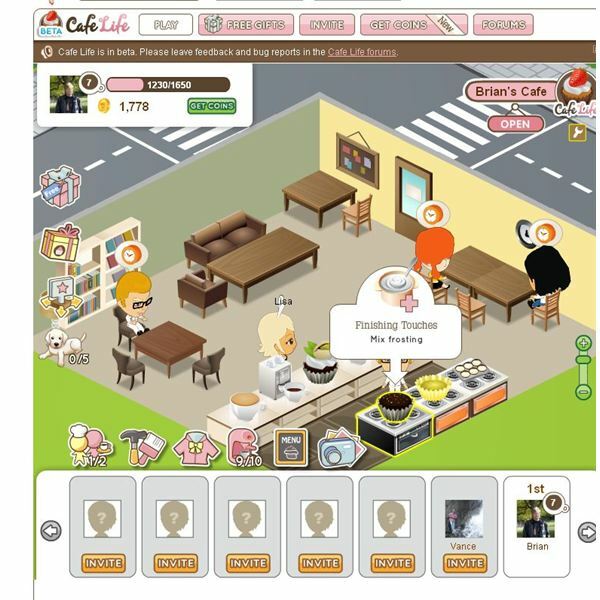 Cafe Life is a fun cooking game and well wort playing on Facebook. The graphics look great and it loads quickly. You won’t be bothered by the popups that occur with other more popular games. This game might be basic and not have a whole lot of extras but it’s one of the better games in this genre on Facebook. Once you play the game for a bit you’ll find that it is really easy.